Some of you have asked me to share some of my go-to foods that I have used to fuel my body along the way. So, I am going to start sharing some of them along the way. I can’t commit to a regular cadence of recipe posts, but I will do it as often as I can and will try to share pictures too in order to help you recreate my recipes. I have struggled to figure out a good breakfast to eat before I go running. I want something with a little protein, some carbs and low calories so my body has some fuel to keep going. That is how I developed my easy banana protein snacks. I have been eating these pre-run (about 30-60 minutes before) with a glass of water and cup of coffee and they haven’t let me down. These are so SUPER easy to make… just 3 ingredients: banana, peanut butter, honey. I almost feel like I am cheating by calling this a recipe! With the 3 basic ingredients, these snacks are pretty packed with nutrition. 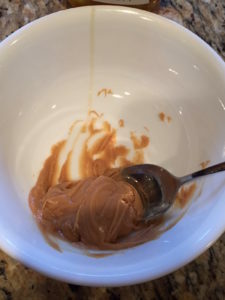 Start by adding a teaspoon or teaspoon and a half of your favorite peanut butter into a bowl. I usually just use the grocery store brand but you can absolutely upgrade to organic or even select a different nut butter. 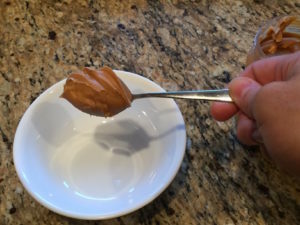 Next up, add a teaspoon or so of honey to your peanut butter in your bowl. 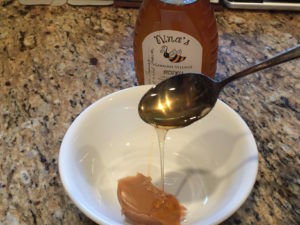 I tend to look for a good locally sourced honey because it tastes better, it has more beneficial stuff (very technical!) in it and it helps support local business. 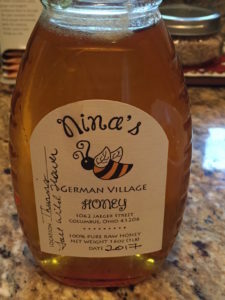 I am in love with Nina’s Honey which is produced a couple of blocks away from my house by an urban beekeeper. Next, stir together the honey and peanut butter until well blended and semi-whipped. 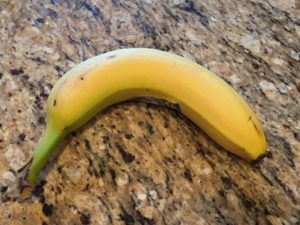 Find a delicious banana, any good ripe banana will do but you can certainly go high end here or just use the grocery store brands. 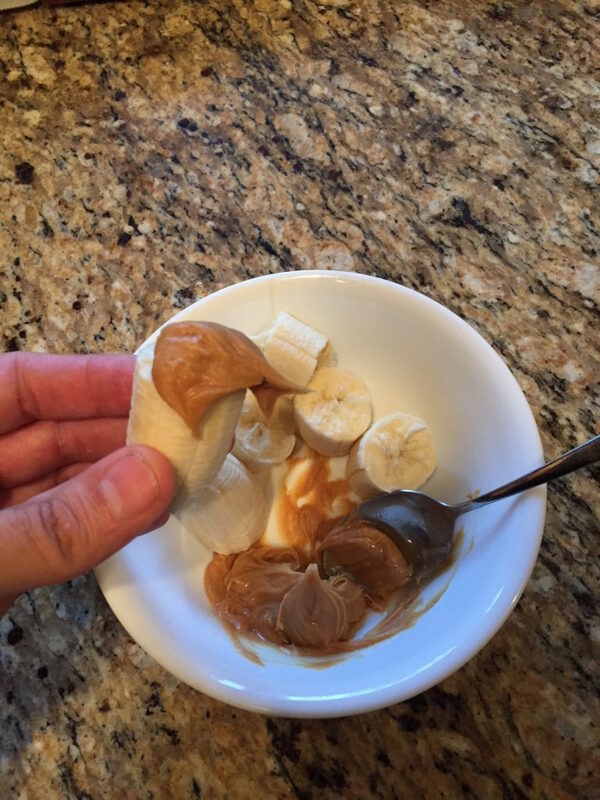 Break the banana into pieces and slather the peanut butter and honey mix onto the banana and enjoy. It is just that simple! I have not tried any upgrades to this recipe yet. I have intentionally tried to keep it simple so my body is able to easily process it when running. But I would imagine that some ground flax seeds would work well in it too. 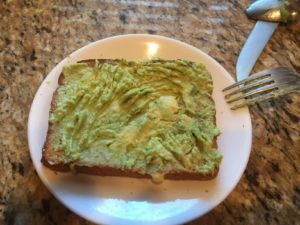 The first recipe I want to share is one of my nearly daily go-to foods, avocado toast. Simply, it is smushed avocado on toast. It is delicious, nutritious and easy to make. Plus, it is pretty versatile with toppings and seasonings and never boring. 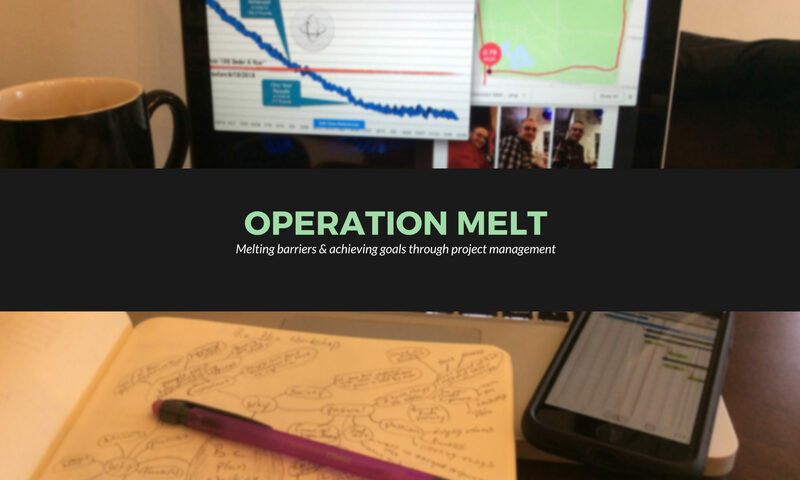 I have previously talked about some of my surprises along the way in my Operation Melt journey. One of those surprises was that my tastes changed a bit and this is one example of those changes. I used to hate avocado and would never have eaten it by choice. Now, I eat avocado in some form nearly every day. So, that is something! Part of why I like avocado toast so much is the nutritional value. First, avocados are miracle foods loaded with health benefits. They are loaded with fiber, protein, potassium and healthy fats. This article discusses 12 health benefits of avocados. So, they are something I really want to put into my body! 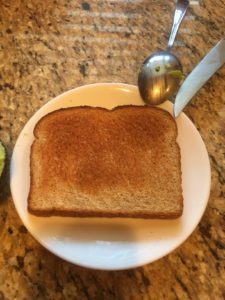 Then, if chosen properly, the bread used for the toast can be very healthy too. Depending on how you make your avocado toast, then nutritional information is something similar to the following. 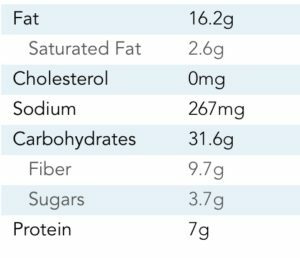 Just look at that fiber and protein content! Making your avocado toast is really pretty simple. But, you need to start with the right ingredients. 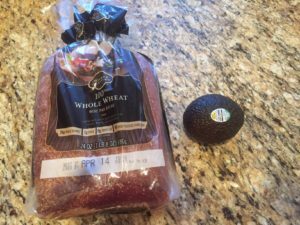 Start with a good ripe, not over-ripe, avocado and whole grain bread. Next, this one is an easy step, just make toast. Toast to your desired doneness. 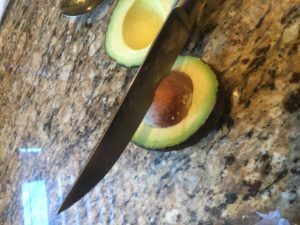 Now, it is time to cut your avocado. 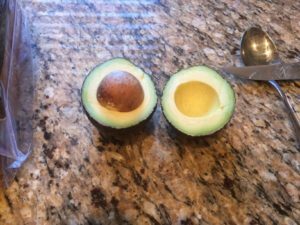 Cut around the outside to split the avocado into 2 halves. Then, use a knife to remove the pit and throw it out. 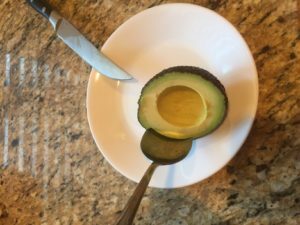 Finally, insert a spoon between the skin and the avocado meat to separate the meat. 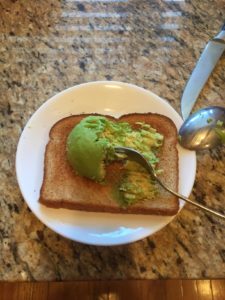 Next, dump the avocado meat onto the toast and smush and spread it with a fork. Finally, it is time to season your toast. 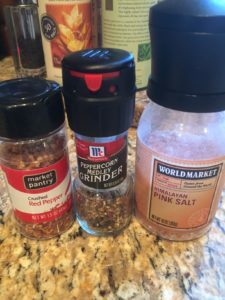 I like to use sea salt, pepper and crushed red pepper in order to make it a bit spicy. And, there you have it, your final product. 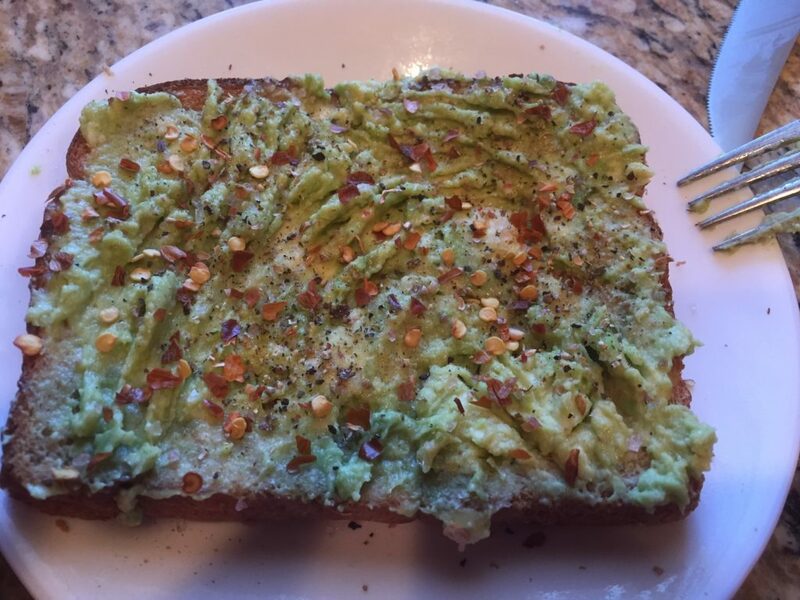 I mentioned before that one of the best parts of avocado toast is its versatility. You can top it with whatever you like. 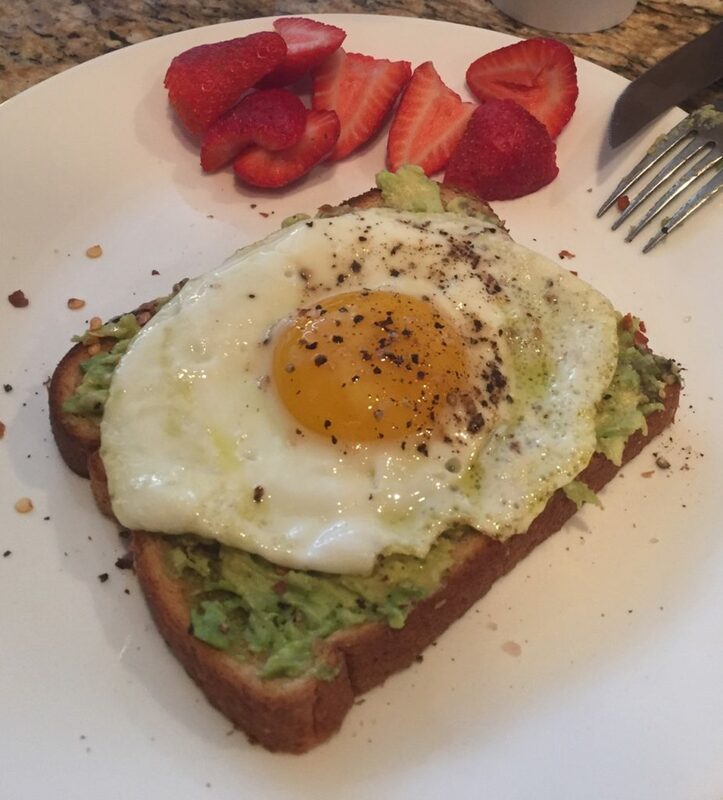 Microgreens or other vegetables are pretty common additions to avocado toast. One of my favorite upgrades is to add an egg – sunny side up adds a touch of challenge and ensures that you get some nice runny yolk! Plus, I like to add some fruit on the side to complete the meal. There you have it, just that simple. Give it a try and let me know how it worked out for you. Plus, if you work in some upgrades, please do share back with me because I am always looking to try new things too.